Ultra-modern and trendy, this is where the dapper and most elegant can be found. 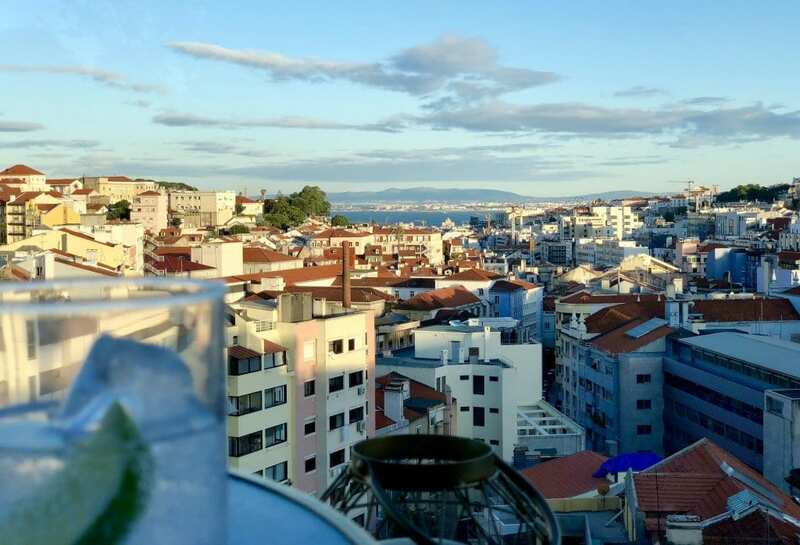 On the 9th floor of the Tivoli Avenida da Liberdade Hotel. The view is incredible, looking over the tree-lined Avenue, to the castle and out to the river, the Sky Bar probably cannot be beaten in the view category.There is a fantastic central bar surrounded by tables both high and low, then on the upper deck you can find sofas and more tables with another bar and DJ who plays relaxing, yet up-beat music. The menu offers a varied range of drinks, wines and cocktails as well as snacks and light meals, don’t be surprised if your sunset turns into dinner, you won’t want to leave. This is a personal favorite of mine; it’s stylish without being pretentious and beautifully decorated in timeless blue and white. 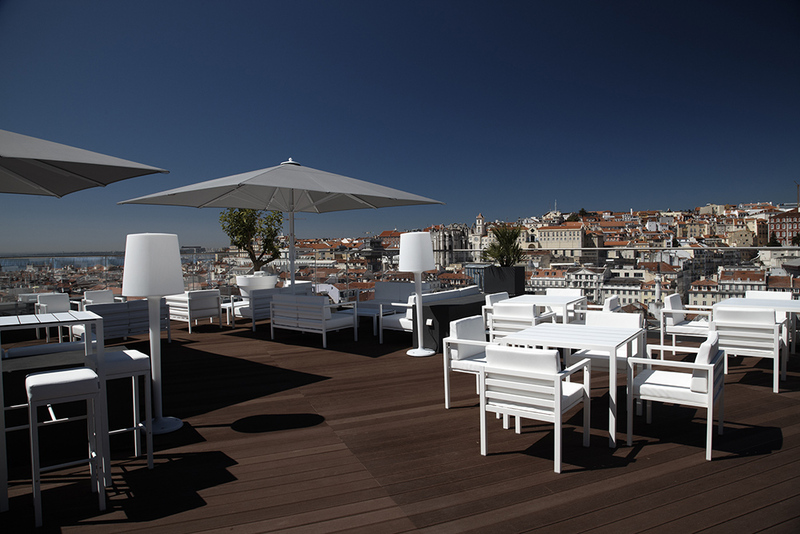 Located on the 10th floor of the H10 Duque de Loulé Hotel. It is quite small, (so maybe we shouldn’t shout about it too much) it has an intimate feel, low tables and wicker chairs line the perimeter and then towards the back and slightly higher (so your view isn’t obstructed) you find comfy sofas and a cozy undercover corner, where you can even make the most of the view on cooler days. At sunset the waiters light the candles and offer blankets, there is definitely no excuse not to order another cocktail. Here there is no loud music or party feel, this is a place to relax, unwind and enjoy your own company or that of others. From here you feel as though you could be in your own fortress looking across directly at São Jorge (St. George’s) Castle, but fortunately there are no battles to be won here, just the rather difficult task of choosing your beverage. The drinks menu is very handsome indeed; you are most certain to find your favorite tipple, or maybe you will try your luck with a recommendation from the bartender, either way you won’t be disappointed. 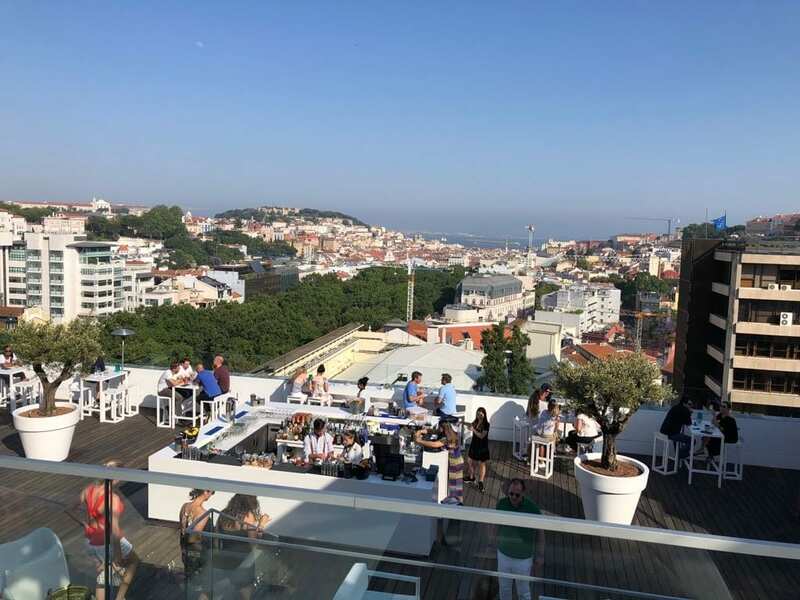 Right in the heart of the Chiado neighborhood, on the 7th floor of the Hotel do Chiado, another great plus is “Entretanto” opens at 10:30 a.m., so you can enjoy the amazing view with morning light right through to night. On the 9th floor of the Hotel Mundial the atmosphere is relaxed and welcoming, with a simple modern decor. 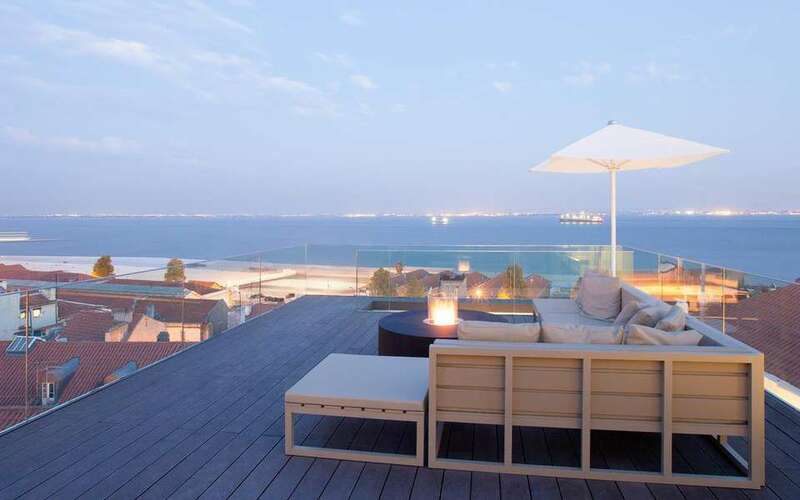 Located on the Martim Moniz Square, one of the liveliest in the city. 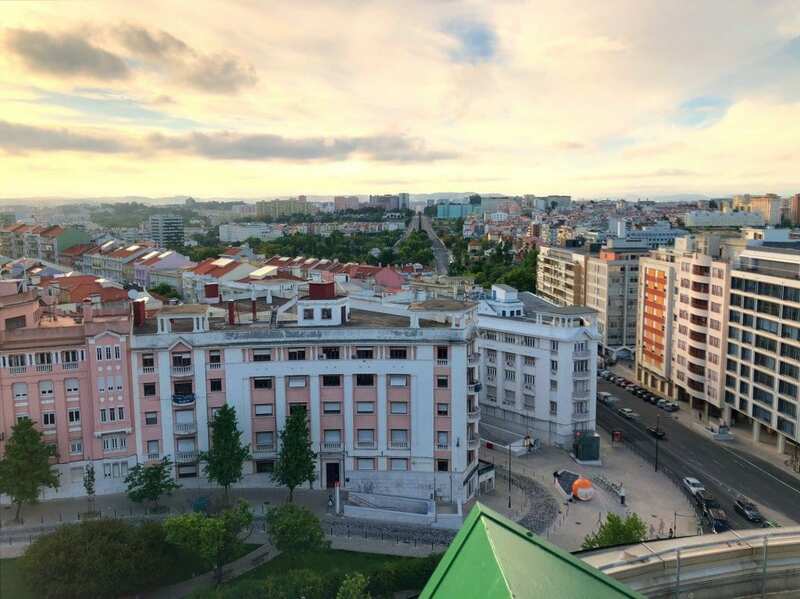 Although up here on the rooftop you feel miles away from the hustle and bustle and yet again the views are stupendous; a cracking perspective of São Jorge Castle, the Tejo and the terracota tiled rooftops of the Baixa. 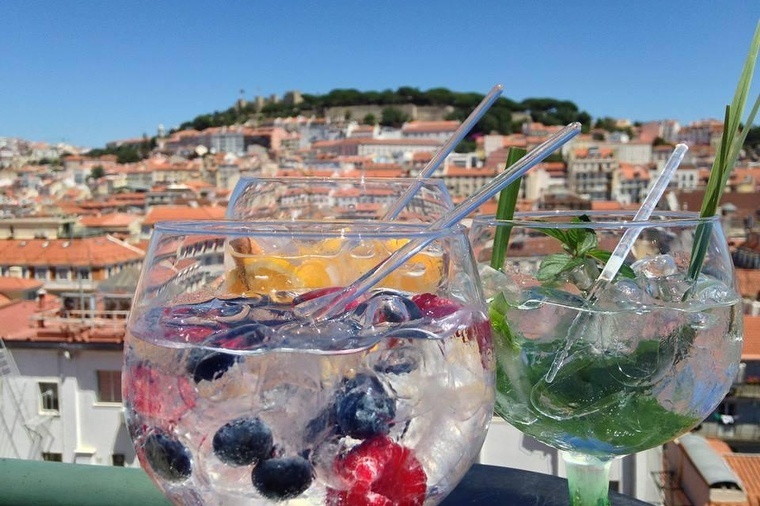 Sip on a refreshing gin and tonic or perfectly chilled glass of bubbly and simply enjoy. Now, this is a slight twist on the rooftop theme, as it’s not actually on the rooftop, but on the first floor of the Memmo Alfama Hotel, however due to it’s positioning in this hilly, ancient district you are actually on top of the surrounding neighborhood and the river Tejo is so close you can almost touch it. The terrace has many cozy corners to sit, choose a glass of wine and a gourmet snack and enjoy the relaxing and utterly stunning view. The top floor of the well-known Spanish department store has been recently transformed into a Gourmet haven. A number of the most elite Portuguese, Spanish and Mexican chefs have teamed up with distinguished brands including Godiva and Dammann, resulting in an array of exquisite flavors and sensations. Not only does this immense luxurious space enable you to sample modern creations of traditional Portuguese tasca dishes by José Avillez, Hawaiian and Asian inspired delicacies by Kiko Martins or Basque pintxos and tapas by Aitor Ansorena, but it also boasts over 1000 square meters of terrace from where you can enjoy that glass of Portuguese wine or a premium cocktail perfectly prepared by the “Gin Lovers”. Here there really is something for eveyone with so many fabulous offerings, you will not be disappointed.